Minnesota Legal Periodical Index on LawMoose: Prepared by the Minnesota State Law Library. You requested articles having title word(s) of Higgs using expanded match written by all authors on all subjects in all journals in MLPI 1984 - present. 1. "Profiles of the Bench: Newest Ramsey County District Court Judges [Cleary; Dorn; Higgs; Leary]"
2. "Five Finalists Announced for Two 2nd District Bench Vacancies [Alshouse, Dorn, Higgs, Leary, Zdrazil] [news note]"
3. "Governor Makes Appointments to District Court Bench [Higgs, Leary, Johnson, Halsey] [news note]"
Search LawMoose Minnesota collections for "Higgs"
Search LawMoose World Legal Resource Center for "Higgs"
Note: While the Index's contents are limited to articles published in Minnesota legal periodicals, the subject matter of those articles may be on any subject. Because free access to any organized body of legal periodical literature is virtually unknown on the Web, except here, we invite you to use the Index as a general reference, especially on federal law and general subjects, while recognizing its limitations for use beyond Minnesota's borders. 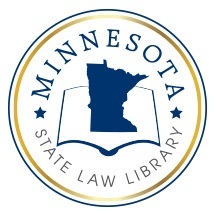 Since 1984, the Minnesota State Law Library has prepared and published the Minnesota Legal Periodical Index. of Pritchard Law Webs, publisher of LawMoose, and the Minnesota State Law Library.